WannaSurf - Free illustrated atlas of surf spots and surfing worldwide with maps of surf spots, detailed descriptions and photos. All the best weather and forecast maps. An interactive environment provides messages, reports and data editing. Visit the website of WannaSurf now ! 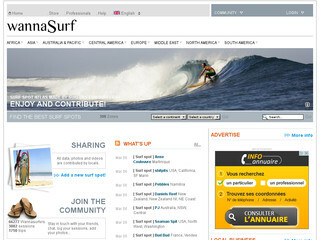 WannaSurf , belonging to category "Others"
SurfSpono is the leader in surf sponsorship, create your profile and get noticed!